Authors: Skryabina Y.V., Astakhov Y.S., Konenkova Y.S., Kasymov F.O., Zumbulidze N.G., Varganova T.S., Petukhov V.P., Pirgunova A.A., Masian J., Klimko N.N., Bogomolova T.S., Desyatik E.A. Fungal keratitis (FK) is a difficult diagnostic challenge for ophthalmologists. The aim is to familiarize practicing physicians with the diagnostic algorithm worked out in the Ophthalmological Center of SPB City hospital No. 2 using modern research methods, and to assess the epidemiology of fungal keratitis in the North-West Region. Materials and methods. Patients underwent laboratory diagnostics (fluorescence microscopy of corneal scrapings from the cornea, сulture on Sabouraud agar and broth), confocal in vivo microscopy, optical coherence tomography. Results. During the period from 2007 to 2017, 41 cases of FK were identified in the City hospital No. 2, of which filamentous fungi were the causative agent in 32 cases (78%), yeast fungi — in 9 cases (22%). Our analysis included patients with fungal keratitis over the past three years, all of them underwent a full diagnostic cycle. Filamentous fungi were found among 12 of them (63%), yeast — in 7 (37%). Our data, considering the statistics of fungal keratitis in the North-West of Russia — a region with a high level of urbanization and industrialization, and located in the temperate zone — showed a predominance of filamentous fungi as pathogens (prevalence 1.3 times higher). Our scheme of keratitis diagnostics — confocal in vivo microscopy, OCT, fungal culture — is a reliable way to identify fungal pathogens in the cornea, and can be recommended for use in practical ophthalmology. fungal keratitis, epidemiology, laboratory diagnostics, confocal microscopy, optical coherence tomography. Fungal keratitis is an infectious inflammatory disease of the cornea caused by pathogenic fungal invasion. Because of the disease’s hypodiagnosis, severity, and complicated and long-term therapy, it poses a significant problem for ophthalmologists. Its treatment is often unsuccessful, leading to corneal opacities, blindness, and even eyeball atrophy [1–6]. The global incidence of fungal keratitis is constantly increasing , which is probably attributable to both improved diagnostics and increased number of risk factors, such as the irrational use of antibiotics and corticosteroids, improper wearing of contact lenses, and growing prevalence of immunodeficiencies. Patients with history of corneal injuries are particularly prone to fungal keratitis . There is still no consensus on corneal mycosis epidemiology. The prevalence of fungal keratitis significantly varies between geographical areas and even between regions of the same country. This disease is more common in developing than in developed countries. Researchers from Hyderabad (India) reported 1360 culture-confirmed cases of fungal keratitis over the last 10 years ; another 654 patients were diagnosed with fungal keratitis in northern China for 6 years . By contrast, only 56 cases (56 eyes) of mycotic keratitis were registered in Melbourne (Australia) and 57 cases (61 eyes) in New York (USA) over the last 8 and 16 years, respectively [11, 12]. The IndoHungarian Fungal Keratitis working group has published a global epidemiological review reporting that mold fungi are the most common causes of keratitis in tropical and subtropical areas, whereas yeast-associated keratitis commonly occurs in developed countries and in areas with temperate climate . A study conducted in the United Kingdom found that the prevalence of mycotic keratitis reaches 0.32 cases per million inhabitants per year  (with a reliability index of 95%). More than 70 fungal species have been proven to cause fungal keratitis, with filamentous fungi and yeast as the primary pathogenic agents. Ano ther group consists of dimorphic fungi that can exist in the form of both mold and yeast depending on the conditions and very rarely cause keratitis [7, 14]. Pigmented filamentous (or phaeoid mycelial) fungi are rarer than non-pigmented ones. They possess a septate mycelium and a large amount of melanin in the cell wall. Hyaline (non-pigmented) hyphomycetes are a group of fungi with a septate mycelium, without melanin in the cell wall (Table 1). Note. Most common fungi described in the literature are highlighted in bold. Impairments in the protective structure of the cornea (including epithelial barrier, tear film, and blinking) significantly increase the risk of fungal infections. Their infection response depends on the fungal growth rate, presence of mycotoxins, fungal antigens, and proteolytic enzymes . Fungi gain access to the corneal stroma via the epithelial defect caused by injuries (including those from wea ring contact lenses), various eye surface disorders, and after surgical interventions. Fungal penetration into the corneal stroma activates the immune cells (including neutrophils, macrophages, and dendritic cells) that recognize fungal cell-wall antigens primarily via Toll-like, NOD-like, and C-type lectin receptors. C-type lectin receptors, such as Dectin-1 and Dectin-2, promote chemokine (CXCL1 and CXCL2) and proinflammatory cytokine (IL1b and TNFα) secretion. Fungi can also invade deep layers of the stroma and the anterior chamber through an intact Descemet’s membrane, inducing endophthalmitis. Mukherjee et al. demonstrated that fungi can produce a protective biofilm during their reproduction to stabilize the growth of colonies. Corticosteroids and other immunosuppressants may trigger fungal infection development and progression by inhibiting proinflammatory cytokine and chemokine transcription, reducing the anti-infective activity of macrophages, and decreasing neutrophil adhesion. It is quite challenging to diagnose early-stage fungal keratitis because patients usually seek for medical assistance at late stages. Moreover, doctors do not usually consider this pathology due to its low prevalence in the population. Samples are collected too late, bacteriological examination is time-consuming, and Heidelberg Retinal Tomography (HRT) with Rostock Corneal Module is often unavailable, although it allows differential diagnosis with other microorganisms (specifically with Acanthamoeba) and a preliminary diagnosis during the first visit. Delayed etiotropic antifungal therapy for >2 weeks  is one of the factors that significantly worsen the prognosis. 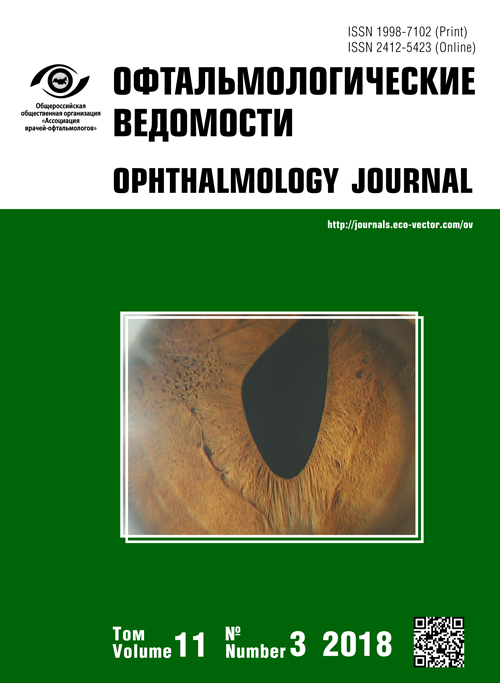 This study aimed to familiarize practicing ophthalmologists with a diagnostic algorithm developed in the Ophthalmology Center of the Saint Petersburg Multifield Hospital No. 2, which describes currently available diagnostic methods and provides information on fungal keratitis epidemiology in the Northwestern region. Modern laboratory techniques and instrumental methods were used to diagnose fungal keratitis in addition to a conventional ophthalmologic examination. The patient should be asked about possible corneal injuries, wearing of contact lenses, occupational risk factors (introduction of soil- and plant-containing particles into the eyes), and impaired local and/or systemic immunity. Then, patients undergo comprehensive ophthalmologic examination such as ocular refractometry, non-contact tonometry, perimetry, biomicroscopy, and ophthalmoscopy. In keratitis, the severity of visual impairment depends on the degree of inflammation, location and size of the pathologic focus, infiltration, corneal edema, and anterior chamber cell score. Biomicroscopy identifies specific signs that indicate the infectious process, including injection, conjunctival chemosis, and corneal epithelial defects. The nature of corneal infiltrate, its type (whether localized or diffuse (purulent), stromal), location, color, density, size, shape, depth, presence of melting areas, necrosis, stromal thinning, satellite infiltrates, neovascularization, and aqueous humor opalescence should also be assessed. Corneal sensitivity should also be evaluated. Sometimes, the infection can manifest as microcrystalline keratopathy (caused by Candida). Pathogen identification can be difficult in patients with primary corneal pathology (with secondary infectious process) and in patients who already underwent antibiotic treatment. The absence of positive dynamics after an antibacterial therapy and deterioration after corticosteroids can be used as surrogate markers of fungal infections. Fungal keratitis is characterized by a persistent course that involves the entire corneal thickness and a trend toward ulceration with perforation. Unfortunately, accurate diagnosis is often established late, which causes significant delays in antifungal therapy. Late initiation of appropriate treatment may lead to serious consequences, such as persistent corneal opacity with leukoma formation, vision loss, and eye loss . Laboratory diagnostics (including microscopy and culture) is required to confirm the presence of fungi in the disease. Corneal scraping is a standard procedure to obtain a sample for microscopy and culture performed by an ophthalmologist using a slit lamp or under an operating microscope preoperatively. To ensure high diagnostic accuracy, specimen collection should be organized prior to antifungal treatment initiation. The procedure was conducted under local surface anesthesia. Before specimen collection, a residual anesthetic was removed from the corneal surface and conjunctival cavity by irrigating them with sterile normal saline solution. Then, the maximum possible volume of the infiltrate was collected using a sterile disposable microsurgical splitter, avoiding touching the conjunctiva. The sample is fixed on the slide and sent to the laboratory within 2 h after scraping. For many years, specialists from N.P. Kashkin Research Institute of Medical Mycology and the Department of Clinical Mycology, Allergology, and Immunology at I.I. Mechnikov Northwestern State Medical University (both the leading research institutions in this field in Russia) perform microbiological diagnostics, patient management, and clinical consultations on the antimicotic treatment. Fluorescence microscopy at ×100, ×200, and ×400 magnification is used to detect fungal elements in corneal specimens. The slides are stained with calcofluor-white, which binds to fungal cell wall containing chitin and serves as a fluorescent marker. The calcofluor solution is prepared by adding Evans blue. Direct microscopy may demonstrate mycelium, pseudomycelium, and yeast cells. Budding yeast cells and pseudomycelium suggest candidiasis; however, the final diagnosis should be established after positive culture. To identify the pathogen, specimens should be inoculated on Saburo agar and liquid medium. Isolated cultures of micromycetes are identified according to their morphological and physiological characteristics using fungi identification keys. Molecular diagnostic methods should also be used as necessary. Yeast growth usually occurs during the first 24–48 h, whereas mycelial fungi demonstrate detectable growth after 2–5 days. Some fungal species, such as Fusarium, may require longer cultivation (from 1 to 3 weeks). On average, microbiological examination takes 7–14 days. Microscopy of the corneal scraping material and its cultivation on selective media remain the gold standard for fungal keratitis diagnostics. Fungal cultural and micromorphological characteristics (most importantly, sporulation organs) can successfully be used to determine the genus and in many cases even the species. However, identification of some species (e. g., representatives of the genus Fusarium, including >900 species) requires molecular diagnostic methods (DNA sequencing). However, this test is time-consuming, requires appropriate researcher qualification, and may delay treatment [18, 19]. In recent years, confocal microscopy and optical coherence tomography have become more widely used. Treatment outcomes directly depend on timely diagnosis. Therefore, effective diagnosis requires the most rapid, sensitive, and convenient diagnostic method [18–22, 24]. Confocal microscopy is a rapid, noninvasive, and safe method of layer-by-layer visualization of the cornea. It provides high-resolution microstructural images of different corneal layers of up to ×3500 magnification. This noninvasive and high-resolution technique allows visualizing cell, infiltrate, and extracellular element details, located in deep layers of the cornea. Conventional microscopy aimed to detect fungal pathogens in specimens taken from the affected sites in vitro, whereas confocal microscopy provides in vivo visualization of fungi directly in the corneal tissue. Confocal microscopy was performed using the Heidelberg Retina Tomograph 3 Rostock Cornea Module (HRT3/RCM) at 400 × 400 magnification. This method allows in vivo visualization of mycelial and mold fungi. HRT3/RCM identifies the morphological structure of filamentous fungi. They appear as single or twisted at different angle white high-contrast filaments (hyphae) with a diameter of 3–10 µm and length of 200–400 µm. The dimensions correspond to those determined by electron microscopy [21, 23, 24]. This method allows distinguishing between hyphae and subbasal nerves with a diameter of 0.3–0.8 µm and stromal nerves, characterized by a linear shape with a thickness of 0.5–5 µm and branching at an acute angle. Moreover, unlike stromal nerves, hyphae are located only within a lesion focus at any stromal depth. Candida pseudomycelium appears like high-contrast spindle-shaped structures of a 10–40 µm length and of 5–10 µm diameter . The method also enables identification of other microorganisms, specifically Acanthamoeba and their differentiation from fungi. Moreover, it provides a unique ability to monitor therapeutic response through regular examinations [21, 24, 26, 27]. Confocal microscopy allows assessing the depth of pathogen invasion into the stroma, which cannot be evaluated by any other method. Optical coherence tomography (OCT) provides a wide range of qualitative and quantitative parameters, including corneal thickness at different sites, size, and shape of the lesion. OCT is used to dynamically monitor the cornea during treatment. Consecutive scans of the same corneal areas using standard protocols allow the evaluation of pathological process in dynamics. At initial stages of microbial keratitis, the cornea is thickened in the infiltration area. The epithelium and the endothelium are usually found as hyperreflective layers compared to the stroma. Edema is visualized as a diffuse stromal thickening, which leads to convexity changes in the posterior corneal surface. As the infection and the inflammation are resolved, the corneal thickening becomes less pronounced. At later stages, patients often develop scarring and the affected cornea can become thinner than the adjacent healthy areas due to scar tissue retraction. Specific OCT characteristics of aggressive fungal keratitis include limited, different-sized cystic formations in the stroma (necrotic tissue) . OCT results can serve as indications of using Tenon-conjunctival flaps and corneal and scleral allotransplantation, among others, with subsequent monitoring of possible graft failure. We use RTVue100 (Optovue) for OCT. The study participants developed keratitis due to ocular trauma (n = 5), wearing soft contact len ses (n = 8), and conjunctival cavity contaminated by soil (n = 2). Patients presented with corneal, uveal, and pain syndromes and also complained of visual impairments with various severity. A total of 41 patients were diagnosed with fungal keratitis in the Saint Petersburg Multifield Hospital No. 2 between 2007 and 2017. Among them, 32 (78%) patients were infected with filamentous fungi, whereas 9 (22%) were infected with yeast-like fungi. In our analysis, patients diagnosed with fungal keratitis during the last 3 years were included. All the study participants (n = 19) underwent comprehensive examination. Eleven of them (58%) were men, and 8 of them (42%) were women. Patients were aged between 27 and 77 years (Fig. 1). The majority of patients (n = 17, 89.5%) were admitted to the hospital later than 1 week after the disease onset. Of them, four patients (21%) were seeking medical assistance after one month and later. Only 2 individuals were hospitalized during the first week. Upon admission, patients usually presented with centrally and paracentrally located ulcerative infiltrative foci with a diameter of 3–5 mm. Some of patients had perifocal satellite lesions, typical of mycotic infiltrates. Filamentous fungi were found in 12 patients (63%), whereas yeast-like fungi were detected in 7 patients (37%). The majority of the patients resided in the North West region (Saint Petersburg) (n = 15, 79%), Pskov, Novgorod, and Vologda regions (n = 3, 16%). One person came from China (5%). The prevalence of different fungi species that can cause corneal mycosis depends on the geographical latitude, climate, agricultural role in the economic structure, and economic level development. Deve loped countries with a poorly presented agricultural sector usually report keratitis cases associated with yeast-like fungi . Immunodeficiencies and widespread use of antibiotics and corticosteroids promote the development of keratitis caused by Candida. Reviews from developing countries, with many people engaged in agriculture, usually report keratitis associated with filamentous fungi. The main cause of fungal infection is corneal injury in rural areas. Our results in the Northwest region of Russia (a highly urbanized and industrialized area located in the temperate zone) demonstrate high prevalence of filamentous fungi, large number of Candida-associated keratitis (37%), and a significant proportion of culturally unidentified fungi (16%) (Fig 2). In our algorithm, confocal microscopy was recommended as the initial diagnostic step. Eleven study participants underwent confocal microscopy using the HRT/RCM system. High risk of corneal ulcer perforation was one of the most common contraindications for confocal microscopy. Thus, these patients were urgently operated. In such cases, pathogens were identified through microbiological methods. In confocal sections, the hyphae of filamentous fungi appear as high-contrast structures lying within the infiltration focus. The number of hyphae demonstrates the degree of fungal contamination (from isolated hyphae to abundant network) (Fig. 3). The pseudomycelium of yeast-like fungi can also be easily detected in confocal sections. Pseudofilaments appear as spindle-shaped high-contrast particles with a clavate end (Fig. 4). All the positive confocal microscopy results (i. e., detection of hyphae and pseudofilaments in confocal optical sections) were later confirmed by either fluorescent microscopy or culture results. The sensitivity of confocal microscopy was analyzed in 11 patients who underwent both microbiological examination and HRT/RCM scanning. Nine out of 11 cases that had positive confocal microscopy results (i. e., detection of hyphae and pseudofilaments in confocal optical sections) were later confirmed by the laboratory examination results. Thus, the sensitivity of confocal microscopy to diagnose fungal invasion is 82%. Filamentous fungi were detected in eight (73%) patients, whereas yeast-like fungi were isolated from three (27%) patients (Figures 5 and 6). Fig. 5. Microscopy of culture (mag. ×400). Culture grew Fusarium spp. Рис. 5. Микроскопия (ув. ×400) и рост культуры Fusarium spp. The pathogen was isolated and identified in 13 patients (68%). The species were identified in five (38%) patients, whereas only the genus was identified in other cases. Both the filamentous fungi (including Fusarium spp., Aspergillus (A. fumigatus and A. flavus), Penicillium spp., and Acremonium spp.) and yeast-like fungi (including Candida (C. tropicalis and C. albicans)) were isolated. Corneal thickness in the affected areas was initially assessed using OCT and then monitored to determine whether the patient needed surgical treatment. The figures demonstrate critical corneal thinning in the affected area (211 µm), which required surgery (Fig. 7). Tectonic keratoplasty is indicated for corneal thinning with a high risk of perforation (deep ulcers with >50% loss of stromal thickness and descemetocele). Patients with fungal keratitis require surgical treatment more often than those with microbial (non-fungal) keratitis (691 out of 1460 [50.8%] vs. 971 out of 2,203 [44.1%]) . In Russia, the majority of ophthalmologists are more inclined to use conservative tactics for corneal ulcers. In 2016, the total number of patients with corneal ulcers was 12,159. Among them, 4,661 (38.3%) patients underwent surgery. We have similar figures in our study: 7 out of 19 patients (36.8%) required surgery. The primary risk factors for fungal keratitis are contact lens wear (42%) and corneal injuries (26%). The prevalence of various fungal species directly depends on the urbanization and industrialization levels. The proportion of Candida keratitis does not exceed 1–2% in countries with well-developed agricultural sector, whereas it reaches 10–40% and 50% in industrial and postindustrial countries, respectively. Developed diagnostic algorithm for keratitis (HRT/RCM plus OCT plus culture) is a robust method in identifying fungal pathogens in the cornea and can be recommended for routine ophthalmologic practice. Confocal microscopy is a rapid and highly sensitive method in detecting fungal biota in the cornea and can be used for early in vivo diagnosis and administration of etiotropic therapy before obtaining culture results. Confocal microscopy combined with culture ensures rapid and accurate diagnosis. Anterior segment OCT allows dynamic monitoring of the cornea, which is needed to control possible indications. The authors declare to have no conflicts of interest related to this manuscript. Huang W, Ling S, Jia X, et al. Tacrolimus (FK506) suppresses TREM-1 expression at an early but not at a late stage in a murine model of fungal keratitis. PLoS One. 2014;9(12):e114386. doi: 10.1371/journal.pone.0114386. Hu J, Hu Y, Chen S, et al. Role of activated macrophages in experimental Fusarium solani keratitis. Exp Eye Res. 2014;129:57-65. doi: 10.1016/j.exer.2014.10.014. Karthikeyan RS, Leal SM, Jr, Prajna NV, et al. Expression of innate and adaptive immune mediators in human corneal tissue infected with Aspergillus or Fusarium. J Infect Dis. 2011;204(6):942-950. doi: 10.1093/infdis/jir426. Qu X, Che C, Gao A, et al. Association of Dectin-1 and DC-SIGN gene single nucleotide polymorphisms with fungal keratitis in the northern Han Chinese population. Mol Vis. 2015;21:391-402. Xu Q, Zhao G, Lin J, et al. Role of Dectin-1 in the innate immune response of rat corneal epithelial cells to Aspergillus fumigatus. BMC Ophthalmol. 2015;15:126. doi: 10.1186/s12886-015-0112-1. Zhu CC, Zhao GQ, Lin J, et al. Dectin-1 agonist curdlan modulates innate immunity to Aspergillus fumigatus in human corneal epithelial cells. International Journal of Ophthalmology. 2015;8(4):690-696. doi: 10.3980/j.issn.2222-3959.2015.04.09. Kredics L, Narendran V, Shobana C, Grou I-H. Filamentous fungal infections of the cornea: a global overview of epidemiology and drug sensitivity. Mycoses. 2015;58:243-260. doi: 10.1111/myc.12306. Gopinathan U, Sharma S, Garg P, Rao GN. Review of epidemiological features, microbiological diagnosis and treatment outcome of microbial keratitis: experience of over a decade. Indian Journal of Ophthalmology. 2009;57:273-279. doi: 10.4103/0301-4738.53051. Xie L, Zhong W, Shi W, Sun S. Spectrum of fungal keratitis in north China. Ophthalmology. 2006;113:1943-1948. Bhartiya P, Daniell M, Constantinou M, et al. Fungal keratitis in Melbourne. Clinical and Experimental Ophthalmology. 2007;35:124-130. doi: 10.1111/j.1442-9071.2006.01405.x. Ritterband DC, Seedor JA, Shah MK, et al. Fungal keratitis at the New York Eye and Ear Infirmary. Cornea. 2006;25:264-267. doi: 10.1097/01.ico.0000177423.77648.8d. Tuft SJ, Tullo AB. Prospective study of fungal keratitis in the United Kingdom 2003-2005. Eye (London). 2009;23:308-313. doi: 10.1038/eye.2008.298. Bourcier T, Sauer А, Dory А, et al. Fungal keratitis. Journal Français d’Ophtalmologie. 2017;40:307-313. doi: 10.1016/j.jfo.2017.08.001. Mukherjee PK, Chandra J, Yu C, et al. Characterization of Fusarium keratitis outbreak isolates: contribution of biofilms to antimicrobial resistance and pathogenesis. Investigative Ophthalmology and Visual Science. 2012;53:4450-7. doi: 10.1167/iovs.12-9848. Keay LJ, Gower EW, Iovieno A, et al. Clinical and microbiological characteristics of fungal keratitis in the United States, 2001-2007: a multicenter study. Ophthalmology. 2011;118(5):920-6. doi: 10.1016/j.ophtha.2010.09.011. Lan L, Wang FY, Zeng G. Staining with methylthioninium chloride for the diagnosis of fungal keratitis. Experimental and Therapeutic Medicine. 2013;6(5):1229-1232. doi: 10.3892/etm.2013.1288. Thomas PA, Kaliamurthy J. Mycotic keratitis: epidemiology, diagnosis and management. Clinical microbiology and Infection. 2013;19(3):210-220. doi: 10.1111/1469-0691.12126. Ansari Z, Miller D, Galor A. Current thoughts in fungal keratitis: diagnosis and treatment. Curr Fungal Infect Rep. 2013;7(3):209-218. doi: 10.1007/s12281-013-0150-110.1007/s12281-013-0150-1. van Diepeningen AD, Brankovics B, Iltes J, et al. Diagnosis of fusarium infections: approaches to identification by the clinical mycology laboratory. Current Fungal Infection Reports. 2015;9(3):135-143. doi: 10.1007/s12281-015-0225-2. Zhao G, Zhai H, Yuan Q, et al. Rapid and sensitive diagnosis of fungal keratitis with direct PCR without template DNA extraction. Clinical Microbiology and Infection. 2014;20(10):O776-O782. doi: 10.1111/1469-0691.12571. Labbe A, Khammari C, Dupas B, et al. Contribution of in vivo confocal microscopy to the diagnosis and management of infectious keratitis. Ocular Surface. 2009;7:41-52. Ledbetter EC, Norman ML, Starr JK. In vivo confocal microscopy for the detection of canine fungal keratitis and monitoring of therapeutic response. Veterinary Ophthalmology. 2015;19(3):220-229. doi: 10.1111/vop.12287. Villani E, Baudouin C, Efron N, et al. In vivo confocal microscopy of the ocular surface: from bench to bedside. Current Eye Research. 2014;39(3):213-231. doi: 10.3109/02713683.2013.842592. Wang LY, Xu ZZ, Zhang JJ, et al. [Topical voriconazole as an effective treatment for fungal keratitis]. Zhonghua Yan Ke Za Zhi. 2016;52(9):657-62. doi: 10.3760/cma.j.issn.0412-4081.2016.09.005. Soliman W, Fathalla AM, El-Sebaity DM, Al-Hussaini AK. Spectral domain anterior segment optical coherence tomography in microbial keratitis. Graefe’s Archive for Clinical and Experimental Ophthalmology. 2013;251(2):549-553. doi: 10.1007/s00417-012-2086-5. Bongomin F, Gago S, Oladele RO, Denning DW. Global and Multi-National Prevalence of Fungal Diseases - Estimate Precision. J Fungi (Basel). 2017;3(4):57-86. doi: 10.3390/jof3040057. Copyright (c) 2018 Skryabina Y.V., Astakhov Y.S., Konenkova Y.S., Kasymov F.O., Zumbulidze N.G., Varganova T.S., Petukhov V.P., Pirgunova A.A., Masian J., Klimko N.N., Bogomolova T.S., Desyatik E.A.